Are you looking for an efficient way to collect information from groups of people, whether it be contact information, survey data, or lead generation? If so, you are probably searching the market for the best online form builder. Look no further. This article will delve into the pros and cons of 6 best online form builders – Formstack, Jotform, HubSpot Free Form Builder, Wufoo, Typeform, and Google Forms. Since each application has a very distinct purpose, making the decision shouldn’t be hard! While each of the online form builders has some sort of specific purpose, they all share some very common core features. After using all of the applications, I can confidently say that all of them are very easy to use. Ease-of-use is important for any kind of software – you don’t have to purchase something, and realize you need a Ph.D. to use it, do you? All builders with the exception of Google Forms use a drag and drop technique for creating forms, which is what makes them so easy to use. Google Forms uses a step-by-step builder, which isn’t necessarily harder. While all of the form builders are, more or less, free to try, some are a lot more generous with their “free” features than the others. So now that we’ve got the general stuff out of the way, let’s jump into each individual software to determine which one is the best online form builder! Formstack has a beautiful and easy-to use UX/UI. 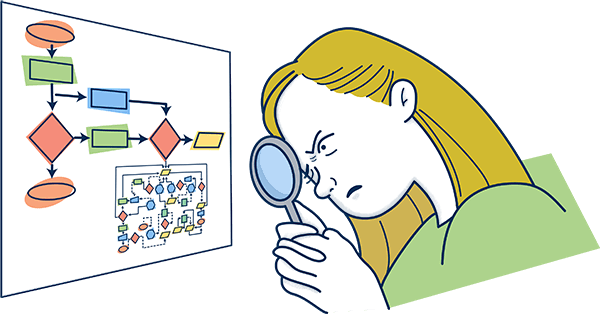 Conditional logic allows you to route the person filling out the form wherever their answers lead them. For example, if someone answers “No” to question 2, and you’d like them to skip ahead to question 4 as a result, Formstack has the capability to do so. With over 40 integrations and 8 payment applications, you can customize your forms for your convenience. Formstack also makes it easy for you to stay true to your brand when creating forms with its customization options. It’s also simple to do so considering the application’s clean and intuitive design. Lastly, Formstack’s multi-page forms allow users to split up long forms. This means people filling out the form can leave and come back without losing their place. Formstack stands out as a form builder for professional use. It’s advanced capabilities ensure that you can create complex forms true to your brand. If you need forms that capture information across your organization such as event registration/feedback or HR forms, then Formstack is a great choice for you. I wouldn’t recommend Formstack to smaller teams or individuals who are looking for simple forms, especially considering the price tag on Formstack. 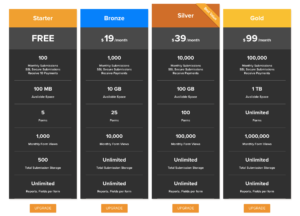 Jotform stands out from the rest with its speed. 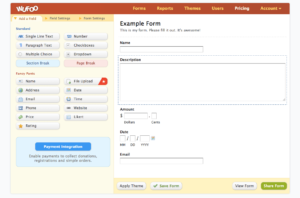 There are loads of themes and templates to choose which makes starting a form fast. 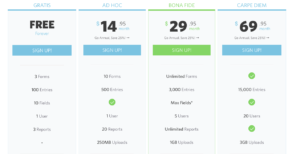 Once you’re actually building the form, Jotform has conveniently placed payment forms, widgets and commonly used fields (ex. name, date, time, email, address, etc.) on the left side for you to quickly drag and drop into your form. Like Formstack, Jotform can perform conditional logic. In addition, Jotform allows you to invite colleagues at any point to work on the form with you. Jotform also gives you the option to send out customized, automatic emails to people who have filled out your form as well as emails to yourself each time someone completes the form. 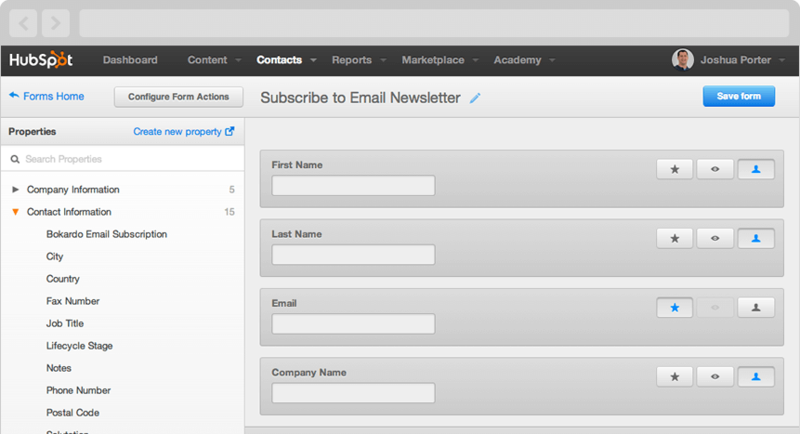 Lastly, Jotform has a beautiful user interface, which makes creating forms somewhat enjoyable. Jotform is perfect for fast, on-the-go form creation, especially considering Jotform’s mobile app. I would recommend Jotform for forms with a smaller audience. Due to Jotform’s lack of customization options, I would not recommend it to enterprises looking for customer-facing forms. If you’ve done anything related to online marketing, you’ve probably heard of HubSpot before. They offer tools for just about any purpose – email marketing, lead generation, SEO, you name it! So, it shouldn’t be that surprising that they have their own form builder software. 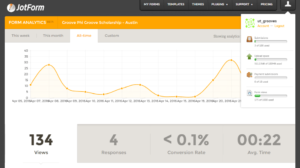 What really sets this tool apart from the rest we’ve mentioned is that it’s focused on lead generation, specifically. As a given, all the functionalities that it comes with are with this specific angle. You can, for example, send out an automatic email to all the new sign-ups. Or, automatically transfer all the data from the form to your HubSpot CRM. 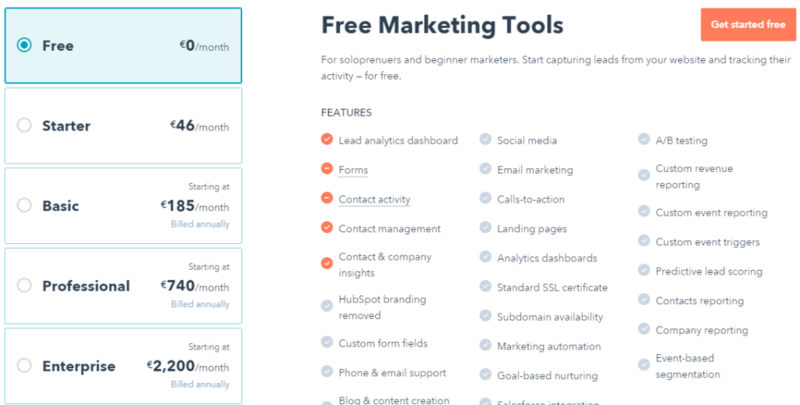 The form builder is part of the HubSpot marketing tools package, which is free for its basic functionalities. 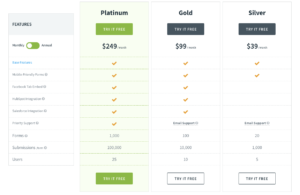 If you want to include custom fields within the forms, you’d need to go for the “starter” package, which costs $46 / month. 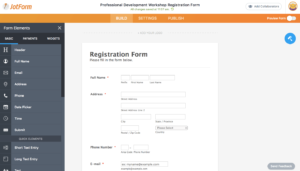 Who is HubSpot Form Builder For? This tool is the best option from all the other form builders if you’re using it for lead generation. The built-in integration with all the other HubSpot tools makes it extremely easy to use and benefit from. If you’re using forms for anything other than lead generation (surveys, research, etc. ), though, the other tools might be a better fit. Wufoo’s most distinct feature is its beautiful and complex reports, which you can see above. You get a lot more analytics with Wufoo than most form builders, and Wufoo automatically presents it in charts and graphs, making it much easier to understand. You can even use the reports for presentations. Wufoo will also keep your data and email inbox clean by preventing duplicate submissions if you’d like. Similar to Formstack and Jotform, Wufoo offers conditional logic. If you’d like to close a form after a certain number of submissions or after a certain period of time, Wufoo can do that for you automatically. One of the only cons I immediately noticed with Wufoo was the tacky user interface. Although it’s very easy to use, the bright oranges and outdated shapes and fonts are not as pleasant to look at as some of the other online form builders. Wufoo excels in robust reporting. Thus, I would recommend it for forms that require powerful reports such as contact forms, surveys, and heavy data collection. Wufoo is the ideal option if you are looking to gather AND organize your data without having to integrate with another reporting system. 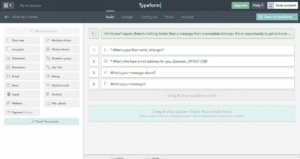 Typeform is an innovative form builder in that it aims to be a conversation with the person filling it out rather than just another form. It makes the process of providing information somewhat interesting and exciting. Because of this, however, it’s quite obvious when a form was built using Typeform, so if you prefer a form that looks like your company has total ownership over it, maybe Typform isn’t for you. 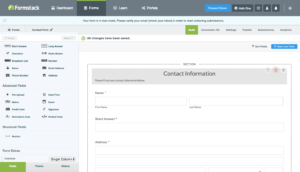 Typeform is proven valuable for lead generation forms in particular. The conversational style allows potential customers to open up to you and provide you with their information. With the paid versions of Typeform, you can set up automatic email notifications for when people fill out your form. Lastly, my favorite aspect of Typeform is the design. It has a super clean and elegant user interface. Typeform’s unique style is aimed at engaging your audience one question at a time. It works best for surveys, quizzes, and lead generation. 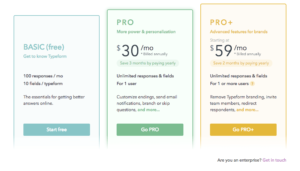 I personally use it to generate leads and can vouch for Typeform’s effectiveness. Check out an example of a form, and you’ll see how fun they can be. They can be more time consuming to fill out, however, so if you just need some simple information and your audience doesn’t have the time for games, I wouldn’t recommend Typeform. Google Forms is the bare bones of all the other form builders. But, this is not necessarily a bad thing, especially since you can get unlimited forms and submissions for free! Pretty much the only exciting aspect of Google Forms are the fun themes and images Google provides you with to spice up your form. However, if you already have a Google account, you may as well check out Google Forms because they work great for your simple online form needs. If you have purchased Google Suite you will have access to more advanced functions within Google Forms. Lastly, the only data that Google Forms will collect is the responses. It will not automatically create reports for you like the others, so if you want any analytics you’ll have to do the math yourself. As mentioned above, Google Forms is totally free. 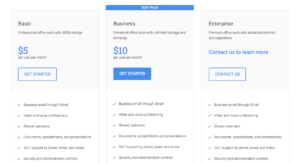 However, if you are interested in purchasing Google Suite for more advanced functions on your forms and other Google apps the prices are below. Who is Google Forms for? Google Forms has a clear audience- Non-business people with basic form requirements. I would recommend Google Forms for smaller community groups who need to capture light information. For example, Google Sheets would work great for birthday RSVPs, event registrations, teacher/student purposes, and applications. If you need a heavy duty form with robust reporting, and you have some money to spend, I would not choose Google Forms. Hopefully, we made it a little easier for you to choose the best online form builder. Of all five options presented- Formstack, Jotform, Wufoo, Typeform, and Google Forms- you can’t go too wrong choosing one. All of these apps will make it easy and fast for you to create a clean form and send it out to your audience. Formstack is a perfect for professional use with advanced functionality. Jotform is go-to for fast form-making for smaller audiences. 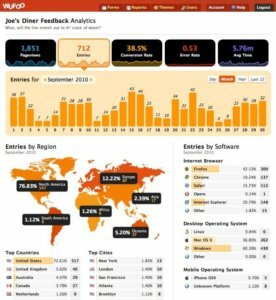 Wufoo’s robust reporting make it a great option if you need to track analytics. Typeform is a new-age form builder. Its engaging style makes it perfect for lead generation. 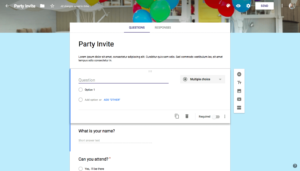 Finally, Google Forms is the perfect option for those who need a basic form to send out to friends, family, team members or peers. Now it’s up to you to decide. And if you’re still stuck in deciding which one’s the best online form builder, you could just try each yourself! They all offer free trials. If you use forms on a daily basis for work, there might be some room for automation. Learn how Tallyfy can help streamline and automate your workflows.